Use to Expand EP1501 and EP1502 Systems. Expandable kits are available for 2, 4, 8 reader expansion. The BluCHIP 2R/8I/6O-E2M is a unified Two Reader/Eight Input/ Six Output System Addition for Four Doors and expansion space to support two additional readers. The kit is configured with space to add backup battery and utilizes an FPO power supply to generate 12 or 24VDC. It includes one Mercury MR52 board, a locking four door enclosure with tamper, power supply and wiring speed kit. It is expandable to four readers with one Mercury MR52 board. The 2R/8I/6O-E2ML is a unified 2 Reader/8 Input/ 6 Output System Addition w/ Managed Lock Power for Four Doors and expansion space to support two additional readers. 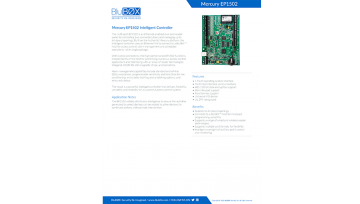 It includes one Mercury MR52 board, a locking four door enclosure with tamper, power supply and wiring speed kit. Local managed lower power is included. It is expandable to four readers with one Mercury MR52 board. Remote management and reporting of power supply and battery health are available through BluSKY Power Diagnostics. The BluCHIP 2R/8I/6O-E4M is a unified Two Reader/Eight Input/ Six Output System Addition for Eight Doors and expansion space to support six additional readers. The kit is configured with space to add backup battery and utilizes an FPO power supply to generate 24VDC and a B100 to generate 12VDC. It includes one Mercury MR52 board, a locking eight door enclosure with tamper, power supply and wiring speed kit. The BluCHIP 2R/8I/6O-E4M1L is a unified Two Reader/Eight Input/Six Output System w/ Managed Lock Power for Eight Doors and expansion space to support six additional readers. It includes one Mercury MR52 board, a locking eight door enclosure with tamper, power supply and wiring speed kit. Local managed lock power is included. It is expandable to eight readers with three Mercury MR52 boards. The BluCHIP 4R/16I/12O-E2M is a unified Two Reader/Eight Input/Six Output System w/ Managed Lock Power for Four Doors. The kit is configured with space to add backup battery and utilizes an FPO power supply to generate 12 or 24VDC. It includes two Mercury MR52 boards, a locking four door enclosure with tamper, power supply and wiring speed kit. Remote management and reporting of power supply and battery health are available through BluSKY Power Diagnostics. The BluCHIP 4R/16I/12O-E2ML is a unified Four Reader/Sixteen Input/Twelve Output Addition for Four Doors. The kit is configured with space to add backup battery and utilizes an FPO power supply to generate 24VDC and a B100 to generate 12VDC. It includes two Mercury MR52 boards, a locking four door enclosure with tamper, power supply and wiring speed kit. Local managed lock power is included. Remote management and reporting of power supply and battery health are available through BluSKY Power Diagnostics. The BluCHIP 4R/16I/12O-E4M1 is a unified Four Reader/Sixteen Input/Twelve Output Addition for Eight Doors and expansion space to support four additional readers. It includes two Mercury MR52 boards, a locking four door enclosure with tamper, power supply and wiring speed kit. It is expandable to eight readers with two Mercury MR52 boards. Remote management and reporting of power supply and battery health are available through BluSKY Power Diagnostics. The BluCHIP 4R/16I/12O-E4M1L is a unified Four Reader/Sixteen Input/Twelve Output Addition Sytem w/ Managed Lock Power for Eight Doors and expansion space to support four additional readers. It includes two Mercury MR52 boards, a locking eight door enclosure with tamper, power supply and wiring speed kit. Remote management and reporting of power supply and battery health are available through BluSKY Power Diagnostics. The BluCHIP 8R/32I/24O-E4M1 is a unified Eight Reader/Thirtytwo Input/Twenty-four Output Addition System for Eight Doors. The kit is configured with space to add backup battery and utilizes an FPO power supply to generate 24VDC and a B100 to generate 12VDC. It includes four Mercury MR52 boards, a locking eight door enclosure with tamper, power supply and wiring speed kit. 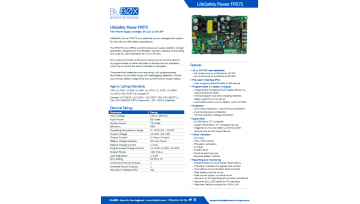 Remote management and reporting of power supply and battery health are available through BluSKY Power Diagnostics.